PPI Claims are now time limited so there is a limited time only to make a claim for mis-sold PPI. However, if you had made a claim before and it was rejected, read on, as you may be entitled to claim again. b. The PPI must be a single premium added to the loan (so does not cover PPI added to a credit card). c. The lender must not have informed you about the level of commissions for the PPI. d. The PPI commission was above 50% of the cost of the policy. Why a second chance to make a PPI claim? The case is called Plevin v Paragon Personal Finance Limited. Even if the case has been rejected by the Financial Ombudsman for PPI mis selling we may still be able to gain you compensation. The reason for this is because the lender has taken undisclosed commissions on PPI policies. We can claim back any commission taken by the lender which is over 50% of the cost and interest incurred on a PPI policy. We can also claim back 8% simple interest which compensates for the amount of inflation since the commissions were taken. 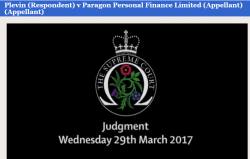 On 12 November 2014 the court of appeal ruled in favour of Mrs Plevin against Paragon Personal Finance as it confirmed that the lender (Paragon Personal Finance) had committed an unfair credit transaction against Mrs Plevin. Commissions payable to intermediaries were high, typically between 50 and 80 per cent of gross written premium for policies sold in connection with a personal loan. These levels of commission were much higher than those payable for introducing the loan itself, which meant that a large proportion of the profits of loan brokers was derived from selling PPI policies. Of the £5,780 premium, 71.8% was taken in commissions from the premium before it was remitted by Paragon to Norwich Union. LLP received £1,870 and Paragon retained £2,280. The net sum of £1,630 was then remitted by Paragon to Norwich Union. The FISA borrowers’ guide told Mrs Plevin that “commission is paid by the lending company”. But neither the amount of the commission nor the identity of the recipients was disclosed. In this case Mrs Plevin received 21.8% which equals the amount over 50% of the commission taken by the lender plus interest taken on the single premium PPI and an additional simple 8% calculated from the inception of the policy. This type of claim can be worth £thousands and if you feel that it is applicable to you please contact us. Not made a claim for PPI? Please contact us today to make a claim for redress. There is a limited amount of time now to make a claim. 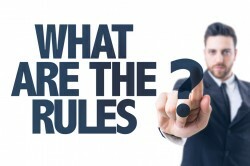 If you do nothing you will never be able to make a claim past the deadline that has been set by the Financial Conduct Authority (FCA) has set a deadline of 29 August, 2019. The FCA have recently advertised on various formats to convince consumers now to make a claim. The big highlight was using Arnold Schwarzenegger hired to highlight PPI claims deadline – this can be viewed on the BBC website: PPI BBC and FCA. The current position is that mis-sold PPI compensation claims have now hit a record £27 billion. PPI was sold along side with a loan or credit card to protect consumers who took out a loan should they fall ill, lose their job, become redundant etc. The problem is that the correct investigations by the lender or broker were not undertaken so many people who purchased the PPI policy with the loan or credit card were unable to claim. Many stories have been told about hardships that have arised due to the fact that a claim against the policy could not be made. At I AM HAPPI SOLICITORS, we have complied a list of the 6 most common mis-sold payment protection insurance (PPI) claims. It is estimated that the PPI sales amount to £4bn a year. If you fit into any of the following criteria you may be rightly entitled to claim back your money. If you were told that the PPI policy was compulsory to take out in order to receive the loan, and if you didn’t, you would not be able to take the loan out. This is a form of pressurised selling of PPI. This is one of the biggest areas of mis-sold payment protection insurance. What usually happens is that the sales adviser or banker failed to notify the client that the payment protection insurance was being added onto the loan. If this was the case, we will assume that the PPI policy was compulsory and you may be entitled to the loan being completely written off as well as you receiving your payment of your PPI and interest back. This area is when the sales adviser “assumes” that the client wants the payment protection insurance even thought they haven’t asked them. The sales advisor must, before selling the PPI check that the customer really needs this policy. If the sales advisor hasn’t asked the right questions when sorting out the loan, the customer could already have a similar insurance policy sometimes through employment which will cover the repayments if they fall ill for example. There are some cases with our clients were they have taken out a second loan with the same bank or money lender. This second loan was then used to pay the final payments of the first loan they took out including the PPI, the lenders have then reissued the PPI on the second loan, which we see as unfair on the customer. The PPI in both loans sold can be recovered and the whole debt may be written off as well. If the client was retired, unemployed or self-employed when they were sold the payment protection insurance by the sales advisor. Then it would be a pointless cover to have because it would be worthless to them in these situations. You could be owed £thousands! Don’t delay making a claim, money could be waiting for you. Just pick up the phone and call 0800 011 2757 between 9.30 am to 6.00 pm Monday to Friday or complete our Online PPI Claim Form. You can still claim back PPI even if you have lost your credit agreement, paid off your loan, if the bank, lender or broker are no longer trading. We will help you every step of the way. Please remember we are PPI claim solicitors, we are not a claims management company and there is a big difference. Please read our PPI Testimonials and read our PPI No Win No Fee Guarantee. Quite simply you have nothing to lose by instructing professional PPI Solicitors as we are only paid if we win and there are NO UP FRONT CHARGES. Quite simply you have nothing to lose by instructing professional PPI Solicitors as we are only paid if we win and NO UP FRONT CHARGES. You can still claim back PPI even if you have lost your credit agreement, paid off your loan or if the bank, lender or broker is no longer trading. We will help you every step of the way. Please remember we are PPI claim solicitors, we are not a claims management company and there is a big difference.